One of Spokane’s most prolific and accomplished artists is being remembered for her relentless pursuit of her artistic vision. Kathleen Gemberling Adkison died on Aug. 3 in Spokane at the age of 93. Her abstract landscapes grew out of a love for mountain climbing, trekking and hiking, family members said. “Technically, she was one of the best around,” said fellow Spokane artist Harold Balazs. Born in Nebraska on July 5, 1917, Adkison moved to Seattle while in high school and studied art there under Leon Derbyshire at Cornish Institute from 1938 to 1942. In 1942, the founder of the Seattle Art Museum, Dr. Richard Fuller, introduced her to internationally renowned abstract expressionist painter and composer Mark Tobey, under whom she continued to study. With Tobey’s guidance, Adkison developed a technique of applying paint to canvases laid directly on the floor rather than using an easel, according to AskART.com. Adkison moved to Spokane in 1948. She taught college art classes as well as offering private instruction, but maintained her connections to the Seattle art scene. 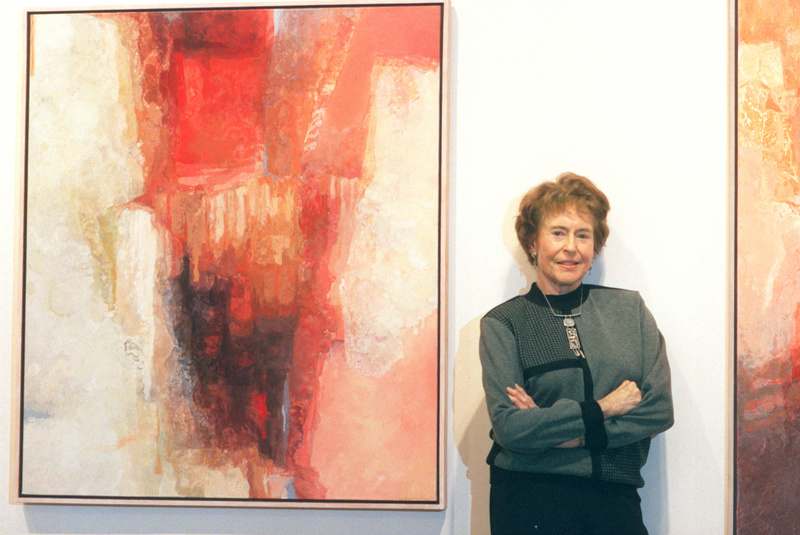 Her first of 22 solo exhibitions in Seattle came in 1957 at Woessner Gallery. Starting in 1963, she was represented by Seattle’s Gordon Woodside/John Braseth Gallery and had 20 solo exhibitions there. Adkison was married to her third husband, Tom Adkison, founder of ALSC Architects of Spokane, in 1968, and the two of them traveled extensively. Shortly after his death in 1986, Adkison climbed twice to the base camp of Mount Everest and was joined by longtime friend Jean Kendall of Spokane. City of Spokane Art Director Karen Mobley said that Adkison is considered a leader in the emergence of the area’s art scene decades ago. “She did beautiful work,” Mobley said, and she built strong affiliations with other artists, participating in group exhibitions. Her accomplishments include numerous art museum surveys and group exhibitions around the country. She was one of eight women artists represented at the Seattle World’s Fair in 1962. Adkison pieces are held by museums and in public and private collections throughout the Pacific Northwest. Locally, her work is found at the Northwest Museum of Arts and Culture, the Jundt Art Museum at Gonzaga University, Spokane City Hall and North Coast Life Insurance Co.
Adkison is survived by her children, Helen Braden and John Van Dewerker; four grandchildren and numerous great-grandchildren. Family members said they are planning a memorial service at a future date in Spokane. Memorial remembrances or inquiries may be made to P.O. Box 6695, Ventura, CA 93001, or by e-mail to jvan9000@aol.com.